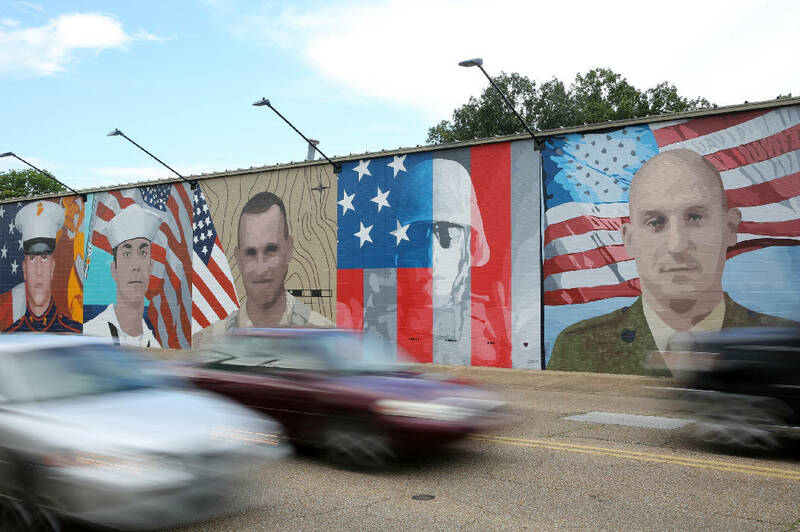 Cars drive in front of a mural for the five servicemen slain on July 16, 2015, in Chattanooga, Tenn. The mural is 22-feet tall and stretched more than 100-feet long. It took the artist Kevin Bate several gallons of paint to complete this project. NASHVILLE — The impact of the domestic terror attack on July 16, 2015, continues to ripple through policy areas ranging from U.S. Department of Defense military gun-carry policies to Tennessee criminal statutes. In May, Gov. Bill Haslam signed a bill boosting prison penalties for people committing violence against uniformed members of the U.S. military, Tennessee National Guard or uniformed police officers. Then-FBI Director James Comey said attacker Mohammad Youssef Abdulazeez, a naturalized American, had been "inspired by a foreign terrorist organization's propaganda." State Rep. John DeBerry, D-Memphis, who sponsored this year's sentencing enhancement, said the impetus for his bill was "the shameful and cowardly attack that happened there in Chattanooga with the loss of lives with those soldiers. "I felt there had to be some enhancement for those who intentionally singled them out for some some type of terrorist act or bodily harm," DeBerry said. Responses to the attack came not just here in Tennessee, but nationwide, adding heat to a long-simmering debate about the ability of U.S. soldiers and National Guard members to defend themselves on American soil. Since then, governors, legislators or National Guard officials in an estimated 23 states, including Tennessee, have revised policies to allow at least some trained guard members to carry either personal handguns or military-issue weapons. It's unclear how many guard members are being allowed to carry. In Tennessee, state Adj. Gen. Max Haston in 2015 allowed changes despite reservations, citing a 2013 incident at a Millington, Tenn.-based National Guard recruiting center where an angry recruiter shot three colleagues. Retired Maj. Randy D. Harris, director of Joint Public Affairs for the Tennessee Military Department, told the Times Free Press in an email that officials aren't divulging how many military members are going armed at state National Guard facilities or other sites co-located with the U.S. military. Providing the numbers "in a public forum could compromise security measures, so we do not provide numbers nor locations of armed individuals," Harris said. Asked how smoothly the change has been implemented and whether there have been any incidents, Harris said no incidents have been reported. The Chattanooga rampage also led to federal changes. U.S. Rep. Scott DesJarlais, R-Tenn., and U.S. Rep. Steve Cohen, D-Tenn., successfully pressed a provision that made it into a 2015 military spending bill. It directed the Pentagon to provide more clarity to existing rules regulating service members' ability to go armed at military bases, facilities like the Chattanooga naval reserve center and recruiting stations. During the July 16 attack, Navy Lt. Cmdr. Tim White used an unauthorized personal handgun to try to stop the attacker. Many in the community were angered to learn White could have faced disciplinary action for violating regulations, but no action was taken against him. The Pentagon in November issued new rules clarifying the role of commanders to decide who would be allowed to carry sidearms and under what circumstances. "Well, considering wheels tend to turn slowly in Congress, I'm happy we were able to get language at least through the defense appropriation bill and gave them a deadline of acting by Dec. 1 which they did," DesJarlais said last week. "We took away the restriction that would prevent the military from protecting themselves at facilities such as Chattanooga," the South Pittsburg congressman said. "I'm satisfied that we gave them the capability to do so." U.S. Army Maj. Jamie Davis, a Pentagon spokesman, said that while federal commanders have always been authorized to decide whether those under them can go armed, the revised policy "clarifies it so there's no ambiguities or gray lines there." But Davis said it's "not just a 'Hey, you're wearing a uniform so you can carry'" provision. "It absolutely does not do that. It says that commanders have that right. If there's a threat, they can issue out under this guidance." DesJarlais said there have been no other attacks against military members since then. "It is yet to be seen whether or not that this will save lives. But it will certainly give our men and women in uniform a fighting chance," he said. "I think it will also help deter future attacks because people who want to commit crimes tend to go to gun-free zones where they know there's no return threat." Earlier this year, White delivered the prayer of the day at a joint session of the Tennessee General Assembly. He received a standing ovation. In the two years since the rampage, Tennessee lawmakers have taken many actions, including providing in-state college tuition rates for the victims' children and extending the state's Fallen Heroes Medal to service members who are victims of terrorism. Another action was $1.58 million last year to beef up security at Tennessee National Guard recruiting stations and armories. And National Guard members with state handgun-carry permits authorized to bring their firearms into state military facilities have both civil immunity and state legal representation if they acted appropriately under a 2016 law. At a 2016 Memorial Day ceremony at the state Capitol, Haslam and top state military officials paid homage to the five slain men, who were awarded posthumous Purple Hearts. And at a May ceremony in Chattanooga, Gunnery Sgt. Thomas Sullivan and Staff Sgt. David Wyatt were posthumously awarded the Navy and Marine Corps Medal, the highest noncombat award given to that branch. According to the Navy and Marines Corps award manual, the medal is given for heroic efforts that are clearly made in life-threatening risks of bravery. Contact staff writer Andy Sher at asher@timesfreepress.com or 615-255-0550. Follow him on Twitter @AndySher.